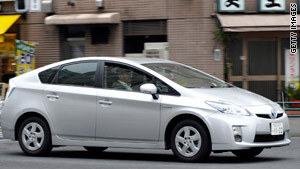 The Toyota Prius has been under fire in recent months over issues with its floor mats and accelerator. (CNN) -- Early evidence points to driver error as the reason a 2005 Prius sped into a stone wall on March 9, according to federal investigators. "Information retrieved from the vehicle's onboard computer systems indicated there was no application of the brakes and the throttle was fully open," according to a statement from the National Highway Traffic Safety Administration. Investigators from Toyota and the National Highway Traffic Safety Administration inspected the wrecked 2005 Prius on Wednesday and extracted data from the car's event data recorder. A housekeeper who was driving the car told police it accelerated on its own as she eased forward down her employer's driveway, causing her to crash into a stone wall on the other side of the road. The housekeeper was treated for minor injuries. No other cars were involved in the accident. Police said the driver, whose name has not been released pending the investigation, has a clean driving record. A team of six inspectors from Toyota and two from NHTSA spent several hours taking photos, measurements and downloading the black box data from the car, which has been at the Harrison Police Department since the accident. iReport: Controversy rages over "runaway Toyota"
In addition, two independent inspectors from a forensic technology company hired by the Police Department, were on hand to help in the investigation. Toyota spokesman Wade Hoyt said that in the 2005 model Prius, the black box contains data only from the moment the airbags deploy, and not the three seconds before impact that newer models are programmed to record. The 2005 Prius was part of Toyota's November recall to address the risk of pedal entrapment in the floor mat. But police said floor mats were not a factor in this accident. The recall to address the sticky accelerator problem did not include the Prius.